I'm sorry to report that this hardly says "Noah James". Roughly translated, it actually reads "Hatch with Comfort" in Hebrew. This new meaning is totally coincidental, and creepily reminds me of Alien. The first name, Noah, is actually correct, assuming that you accept its Hebrew pronunciation - NO-akh. However, it was placed as the second word. Remember, Hebrew is written right-to-left, the first word should be on the right. The second name, James, is simply bogus. Whoever composed this, probably had no clue how to write James in Hebrew. Solution? Take a different name - Jacob, and flip it backwards. Voila! So, this is how you write "Noah James" in Hebrew. I've written two versions - the top features the Hebrew pronunciation of Noah (NO-akh), on the bottom is the English one (NO-ah). And there's also the fact each word is written with a different font, and one has punctuation and the other doesn't. It really looks like this person got the name of their significant other tattooed on their back. Jacobus is Latin for James. i just read the first word not as a verb bit as a noun, thus 'noah's fissures' - bik'ey noakh. a good one! ^ yes, that's what I saw also. Always thought there were some holes and cracks in the Flood story. The different fonts is odd. Ethan, above, may be closer to the truth than the victim cares to admit publically. hey there, i want to get a tatoo saying 'daughter of God' in hebrew, going vertically down my neck - can you pleeeeeeeeeeasee show me what that should look like?? This is too funny. 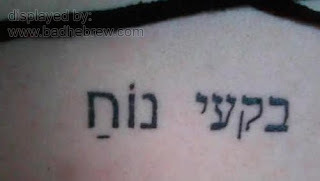 I'm Israeli, and this tatoo also translates into "Noah's Hernia". I guess he got it after lifting the elephants into the ark. James is in fact a derivation of Jacob, starting with Jacobus and going through 2000 years of European language evolution. I think the first word is Becky - and whomever translated it probably spoke Yiddish so they added an Ayin. I am wanting a tatoo of simply Noah, would it be correct to have the 2 characters nun and chet, with nun on the right? Actually, as others above have noted, James IS in fact a derivation of Jacob - so, despite all the other problems in this tattoo, the Jacob thing isn't wrong. Actually, the little line underneath the letter 'Het', on the left, makes an -AA- sound, so it doesn't even translate into the word 'Noah' in hebrew comfortable, but into 'Noha', which technically isn't even a word. @Anonymous who posted last: You're wrong. Noah is written with an A under the Het, and so are other words like Moach (brain) or Koach (strength). I don't know the reasoning behind this, but it's one of the weird things Hebrew does. Shouldn't it read w/a zayin at the end of "James" instead of samekh? Phonetically speaking (which is what you need to consider when transliterating, not literal letter-to-letter line up), it's pronounced jeymz, not jeymsss. @Typo wrote: "Noah is written with an A under the Het [...] don't know the reasoning behind this". if you look in a decent Hebrew bible you'll see that "hataf patach" is placed under and between the last two letters. This makes sense, because it's as if the vowel is between these two. However, "modern" typing machines couldn't do this so nowadays we unfortunately put the "hataf patach" under the last letter. Some have correctly pointed out that the Hebraic origin of the name "James" is יעקב "Jacob".